Good cow. Very good cow. Cows are cute. Even the big cow is not without its healthy charms. But yes, cows are cute.Much cuter than the general public would ever want to admit. The dumbness of dogs with the adorable lazy energy of cats, rolled into one perfect animal where you can both cuddle their cute little selves and also get milk from them. Can hamsters do that? I mean, maybe if you’re a freak, but generally no! But in any case, we’ve got a cute animal video starring the oft ignored and much derided queen of the range — we’re talking… the cow. 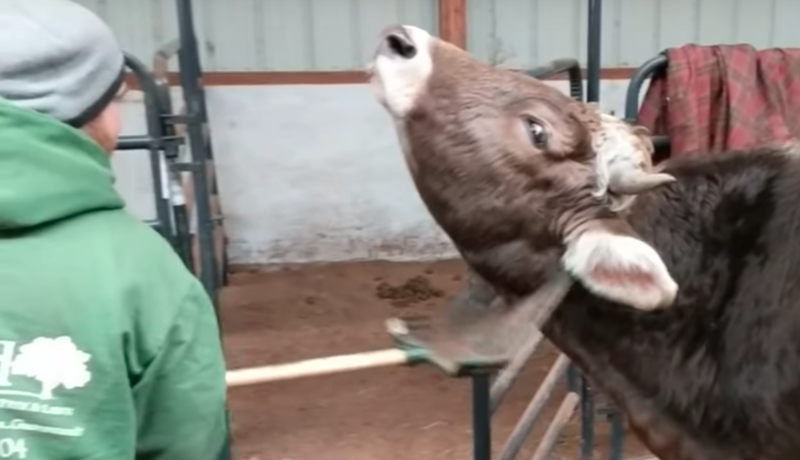 And this cow… is getting its fur raked in a video. So you know, we generally stan our cow queen, as progressive souls in the nation must. Check out the video of this cute little back scratched being below. I mean, look at that sweet little critter! Look at how much she loves getting her neck scratched! This cow is a perfect and sweet angelic being and I am on the finest plane flying down a to a farm to hug her cute little neck, right now! Aww. What a little sweetie. Uhh… we stan. If this cow had a TV show where people just came across the country to scratch his little steer back, oh we would be there in an absolute heartbeat. Such a sweetie. Good cow, I say. Good cow. I wonder what kind of farm animal I should post about next. I think I’m going to do a sheep. Sheep are some underrated viral video fodder. They got wool, they got a cute face, they got deep black eyes. Sheep… get ready for your spotlight, my woolen little friends. What do you think of this sweet little bovine? Let us know in the comments or on Twitter at @WhatsTrending.